Partnership Offers Home Security at a Fraction of the Cost. The Oomi Security Kit combines home security with smart home technology and is available for pre-order today at a deep discount. Actually being, not just feeling, safe and sound is a paramount consideration for most people. We want to ensure that it is easy enough for anyone to set-up, and affordable enough for anyone to have. 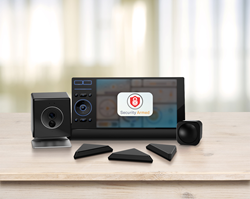 The Oomi Security Kit is currently being offered during a limited time pre-sale event for $389, a savings of $310 off retail. Oomi Cube - a sensor-packed brain for the entire system. It includes 8 sensors and a night vision camera. Oomi Touch - the primary controller for the Oomi smart home system enables Tap-and-Touch set-up of accessories in two easy steps, it can even control television and replace old remotes. Oomi also offers additional smart home accessories outside of the Security Kit including: Oomi Bulb, which is a color-changing LED bulb; Oomi Streamer, which can play content from the internet on high definition television, and Oomi Air, which is an air quality sensor; and Oomi Plug, which turns normal outlets into smart outlets. In just over one week after launching on Indiegogo, Fantem’s flagship product, Oomi, has reached almost $500,000 in funding. Fantem originally sought to raise $50,000 with this campaign, and surpassed its original funding goal for the smart home system within the first 37 minutes. Fantem is a developer of innovative products and solutions for the home. It is dedicated to the worldwide consumer adoption of smart home technology and the Internet of Things (IoT) through the development of home automation solutions that remove the complexity and frustration associated with existing systems. Together with its global team of experts and partners, Fantem set out to create the first smart home management system that is not only the easiest to install, set-up, and use, but also the first smart home system that is actually smart. The result of this effort, Oomi, is set to revolutionize the future of home automation, not only by positively impacting upon multiple areas (home safety and security, home environment and home entertainment) of users' home lives, but by also making it accessible to the everyone - "a system designed for the rest of us!" Fantem is based in Chicago with offices and strategic partners spanning four continents. For more information, visit http://www.oomihome.com.